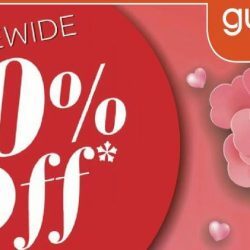 7 - 13 Feb 2019 Guardian: 20% OFF Storewide with No Minimum Spend In Stores & Online! Celebrate the new year by stocking up on all your favourite essentials! Save 20% STOREWIDE only at Guardian from 7-13 Feb! Shop now at all stores or online! 24 - 27 Jan 2019 Guardian: Get 30% OFF All Cosmetics at all Guardian Stores & Online! 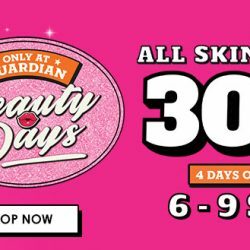 [Beauty Days - Cosmetics] Get 30% off ALL cosmetics on all your favourite brands from 24 - 27 Jan at Guardian! And receive a pack of FREE Red Packets with every $88 spent. Shop now at your nearest Guardian store or online now! 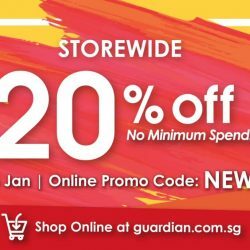 3 - 6 Jan 2019 Guardian: Get 20% OFF Storewide with No Minimum Spend In Stores & Online! Kickstart 2019 with 20% OFF storewide with NO minimum spend at Guardian! Stock up on all your favourites from 3 - 6 Jan 2019. Shop now at your nearest store or online using the promo code! 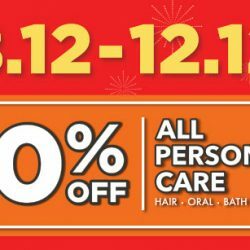 8 - 12 Dec 2018 Guardian: 12.12 Sale with 30% OFF All Hair, Oral, Bath & Feminine Care Products! Get a massive 30% OFF Toiletries and daily Flash Deals from now until 12.12 at Guardian stores islandwide and online! Use promo codes to get additional $12 or $24 off with min. spend! Shop now at your nearest store or online! 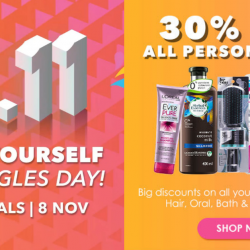 8 - 11 Nov 2018 Guardian: Enjoy 30% OFF Hair, Oral, Bath & Feminine Care + $10 OFF with $80 Spent! Singles Day starts early! For 4 days only, treat yourself to Guardian's daily 1-for-1 deals! It's 30% off all Personal Care and you can also enjoy instant $10 off with $80 spent on UOB cards! Sale ends 11 November 2018. 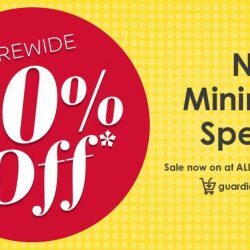 4 - 10 Oct 2018 Guardian: 20% OFF Storewide with No Minimum Spend In Stores & Online! 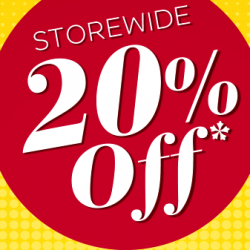 20% OFF STOREWIDE is finally here at Guardian in stores & online! Stock up on all your essentials and SAVE BIG from 4 - 10 October with NO Minimum Spend! That’s not all - there's additional discounts for some of our favourites for 4 DAYS ONLY!! 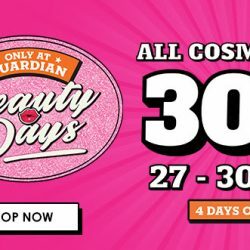 27 - 30 Sep 2018 Guardian: Enjoy 30% OFF All Cosmetics + Daily Deals at Up to 50% OFF! Hey beauties! Enjoy 30% OFF ALL cosmetics from 27 - 30 Sep at Guardian! What’s more snag their daily deals going at UP 50% OFF! Shop now at all stores or online now! Terms and Conditions apply. 20 - 23 Sep 2018 Guardian: 4-Day Special Sale with 25% OFF Selected Beauty Products, 3 for 2 & Up to 68% OFF Selected Health Products! 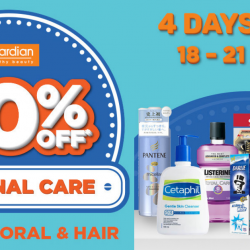 Shop for your beauty and health products at Guardian's 4-Day Special Sale! Check out 25% off selected beauty products, 3 for 2 and up to 68% off selected health products in stores and online! Sale ends 23 September 2018. 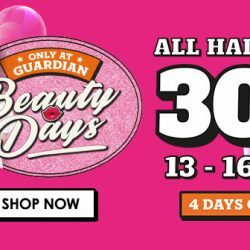 13 - 16 Sep 2018 Guardian: Get 30% OFF All Haircare for 4 Days! Need to stock up on your haircare necessities? SAVE 30% off ALL haircare for 4 days only from 13 - 16 Sept at Guardian! What’s more get a *FREE BEAUTY GIFT with $80 spend in-stores on any beauty products! *FREE Beauty Gift is currently out of stock online but available in-stores. 6 - 9 Sep 2018 Guardian: Enjoy 30% OFF All Skincare, Facial & Bodycare In Stores & Online! Say YES to healthier & happier skin! Shop with Guardian and enjoy 30% OFF ALL SKINCARE, including facial & bodycare. What’s more, get a FREE BEAUTY GIFT with $80 purchase of beauty products! Available in all stores and online now! 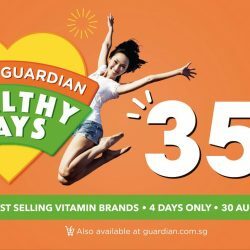 30 Aug - 2 Sep 2018 Guardian: Get FLAT 35% Off across 100 Vitamin Brands for 4 Days Only! Enjoy exclusive deals from Guardian's 100 Best Selling vitamin brands from 30 August 2018 to 2 September 2018 ONLY at Guardian! 4 Days only! 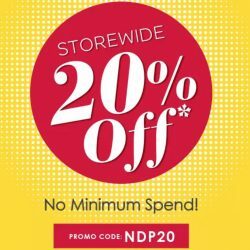 Till 15 Aug 2018 Guardian: National Day Sale – 20% OFF Storewide with No Minimum Spend Online! Guardian's 20% OFF STOREWIDE is back again! In celebration of our nation’s birthday, take 20% off your favourite essentials from now until 15th Aug with NO Minimum Spend! Get free delivery to your doorstep with orders above $40 or order and collect at any of Guardian's 118 stores at no charge! 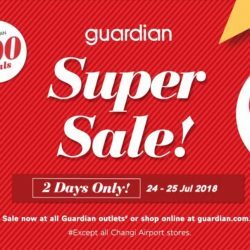 24 - 25 Jul 2018 Guardian: Super Sale with Up to 80% OFF over 800 Deals & Buy 1 Get 1 FREE Offers In Stores & Online! The Guardian Super Sale is back! Today and tomorrow, (24 - 25 Jul 2018), shop your way to better wellness with up to 80% off over 800 deals and Buy 1 Free 1 offers at ALL Guardian stores (except Changi Airport stores) and Guardian Online! What’s more, spend S$80 on your Delight Card or S$100 on any other UOB Cards in-stores to receive a S$5 voucher! What are you waiting for! Visit guardian.com.sg/gss for more info. T&Cs apply. Till 22 Jul 2018 Guardian: 30% OFF All Haircare In Stores & Online for 4 Days Only! Listen up, fellow Guardian fanatics! Save up to 30% off ALL haircare from now till 22 July! Visit any guardian stores or shop online now! Limited quantities only, available whilst stocks last. 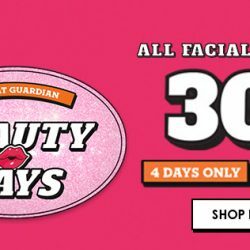 28 Jun - 1 Jul 2018 Guardian: Exclusive 30% OFF All Facial Skincare In Stores & Online! Hola skincare junkies! Time to stay fresh-faced all season with Guardian’s exclusive 30% off ALL Facial Skincare from now till 1 July! Visit any guardian stores or shop online now! Limited quantities only, available whilst stocks last. 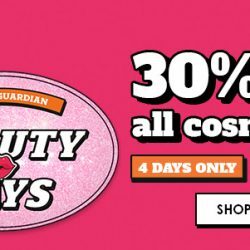 14 - 17 Jun 2018 Guardian: Enjoy 30% OFF ALL Cosmetics In Stores & Online! STOP what you’re doing, because Guardian is offering you 30% off ALL COSMETICS now! Yes, It's unREAL. Head over to their stores islandwide or shop online via www.Guardian.com.sg/beauty-days. Limited quantities only, available whilst stocks last only! 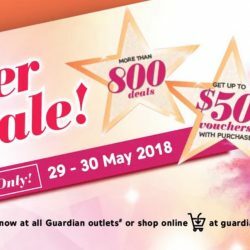 29 - 30 May 2018 Guardian: 2-day Super Sale with Up to 60% OFF, Up to $50 Vouchers with Purchase & More than 800 Deals! It’s time to shop til’ you drop from 29 May - 30 May, Guardian shoppers! SAVE up to a massive 60% off and choose from over 800 awesome deals! What’s more - simply spend a minimum of $80 and get a $5 UOB - Guardian voucher too. Available now at ALL stores and online from 29 May to 30 May 2018! Excludes Changi Airport stores. Till 13 May 2018 Guardian: Enjoy 20% OFF Storewide with No Minimum Spend! Treat your Mum this Mother’s day with a FREE Liphop MASK in the comfort of her own home when you buy 3 items at Guardian! Visit Guardian stores to enjoy 20% off storewide with no minimum spend before it’s too late. Terms & Conditions apply. You can also shop online with 20% off sitewide using a coupon code! 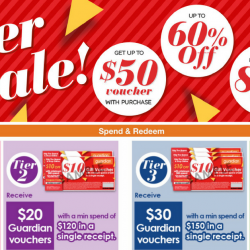 27 - 28 Apr 2018 Guardian: 2-day Super Sale with Up to 60% OFF & Get Up to $50 Voucher with Purchase! Guardian Super Sale is back from 27 - 28 April! 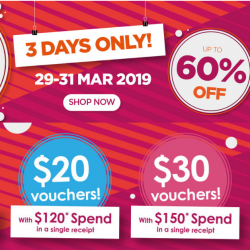 Enjoy up to 60% off, up to $50 voucher with purchase and more than 800 deals! Also get $5 voucher with min $100 spend + up to 2% rebate with UOB Cards. 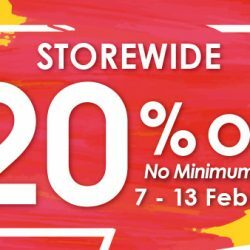 Till 28 Feb 2018 Guardian: 20% OFF Storewide Sale is Back with No Minimum Spend In Stores & Online! The Guardian SG 20% Storewide Sale is back! From 22 - 28 February, enjoy 20% savings across all major categories with no minimum spend! Available at all your nearest stores and online with promo code upon checkout. 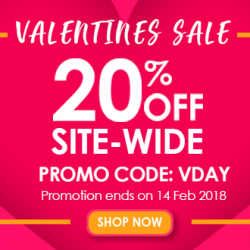 Till 14 Feb 2018 Guardian: Enjoy 20% OFF Site-wide with Coupon Code! Your heart may skip a beat, but don’t skip this Valentine’s Day sale! For 3 days only, Guardian is giving you the lovely gift of 20% off site-wide to pamper yourself or surprise your significant other. Take a look at their Valentine’s Day picks below and use the promo code to get a heart-ful of savings! 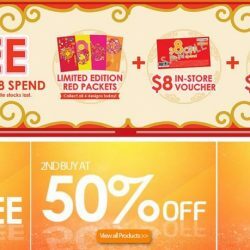 Till 22 Feb 2018 Guardian: Enjoy up to $18 OFF + Buy 1 Get 1 FREE Offers + Collect All Limited Edition Red Packets! Huat at Guardian with FAB-ulous offers starting today! For every $68 spent, enjoy $8 off in-stores and $18 off online! What's more - get your hands on a set of the Limited Edition red packets too!! There are 4 huat colours to choose from! Hurry! Promotion will last until 22 Feb 2018.